Qatar Insurance Group, the leading insurer in Qatar and the Middle East North African (MENA) region yesterday announced its financial results for 2018. Following a meeting of the Board of Directors, which was presided over by Sheikh Khalid bin Mohammed bin Ali Al-Thani, Chairman & Managing Director, the Board approved the financial results. Despite an adverse backdrop, QIC Group, being a diversified insurance Group with international presence, in 2018 recorded Gross Written Premiums (GWP) of QAR 12.6 billion, an increase of 8% compared to 2017. Weathering heightened global market volatility and tightening monetary policy conditions, QIC’s investment and other income amounted to QAR 863 million in 2018, which demonstrates the Group’s substantial capacity to successfully deal with crisis. This resulted in a notable increase in the net profits which amounted to QAR 664 million, an increase of 57% compared to the last year. The Group’s net underwriting income steeply increased to QAR 576 million against QAR 115 million in 2017, the third quarter of which saw a devastating series of major hurricanes (Harvey, Irma, Maria). QIC diligently applied its recently adopted strengthened reserving governance and philosophy, resulting in a more cautious view of ultimate loss projections and making it less vulnerable to market fluctuations. The Group continues to expand the low volatility business which represents a considerable portion of its total portfolio. The Group’s international operations namely Antares, Qatar Re and QIC Europe Limited (QEL) remained the key growth engines and represented 77% of total gross written premiums while the local and regional markets represent 23%. Qatar Insurance Group’s acquisition of Markerstudy Group’s Gibraltar-based insurance companies by its subsidiary Qatar Re is another milestone in QIC’s shift towards low volatility business and on its journey towards becoming a Global Top 50 Insurance Group. 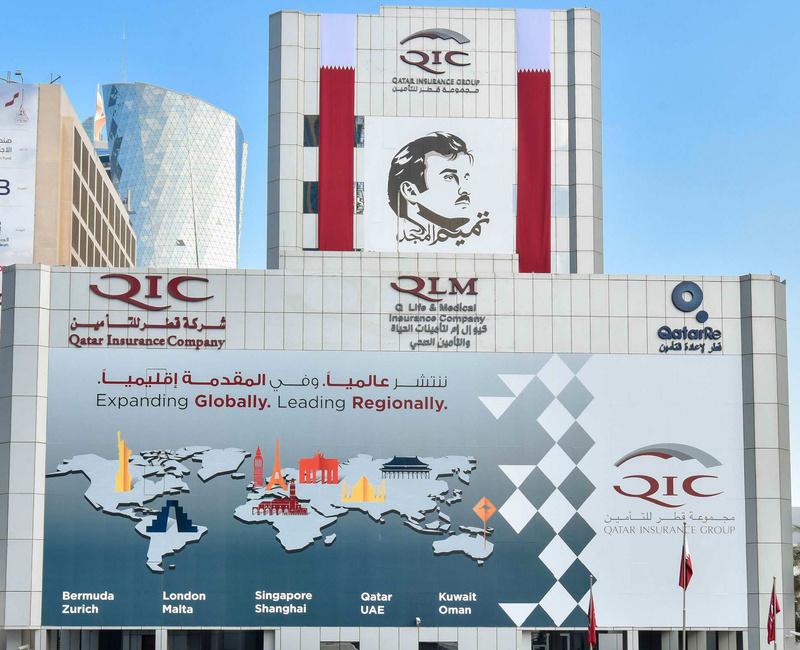 QIC Group ’s domestic and MENA operations growth remained stable, while the Company’s Life and Medical insurance subsidiary, QLM, headquartered in Doha, and OQIC, the Group’s listed subsidiary in Oman, continued to expand. Further impetus for growth arose from the ongoing digitalization of the Group’s MENA retail pillar. One of Qatar Insurance Group’s most notable successes in 2018 is that Qatar-Re has been ranked 27th amongst the global top 50 reinsurers, up from rank no. 35 in 2016, according to international credit rating agency A.M. Best. This reflects the strength of the company’s capital and the diversity of its portfolio serving the global reinsurance markets, as the total gross written premiums of Qatar-Re in 2017 was QAR 5.9 billion. Qatar-Re shareholders’ total equity as of December 31, 2018 stood at QAR 4 billion. The Group President & CEO noted that the primary objective of the Group is to enhance return on the stock and to contribute effectively to the growth of the Qatari economy along with ensuring that the company’s growth continues at a steady pace and complies with Qatar National Vision 2030 under the wise leadership of the Emir of Qatar – Sheikh Tamim bin Hamad Al Thani – may Allah protect him.